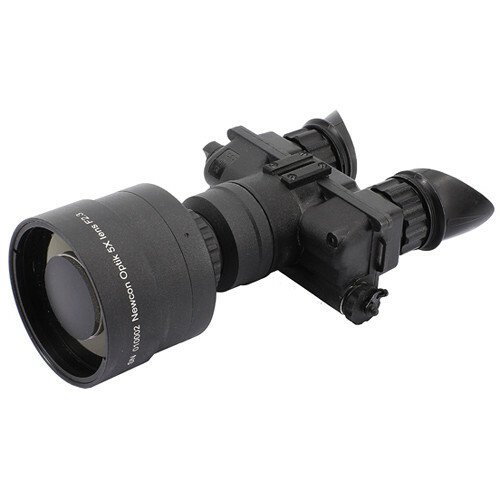 The NVS-7 5x Gen 3 Night Vision Biocular from Newcon Optik is third generation night vision device designed for mid-range applications. This configuration of the NVS-7 comes with a 5x wide-aperture catadioptric lens that transmits an angular field of view of 8°. At the core of this biocular is a Gen 3 intensifier tube capable of 64lp/mm resolution and 20:1 signal-to-noise ratio, delivering crisp images in low-light conditions. Since the Gen 3 intensifier tube has below a 1250 figure of merit rating, this NVS biocular is not restricted by ITAR export regulations. This high-performance tube/optic combination provides the image quality required for most low-light and no light applications. If the next hunt or search-and-rescue mission requires a different focal length, then the NVS-7's interchangeable lens system allows the 5x optic to be switched for one of Newcon's (1x, 3x, 4x, 8x) NVS accessory lenses. The biocular is also compatible with a range of accessories that enable head and helmet mounting, even connection to video and SLR camera or laser rangefinder. In addition to the f/2.3 lens system and 64lp/mm tube resolution, this biocular also meets Mil-Std 810 specifications for weatherproof performance. Even in heavy rain, subzero temperatures, or extreme humidity, the NVS-7 is built to consistently deliver. The NVS's dual-ocular design and long 25mm eye relief make this NVD well-suited for comfortable viewing during long-duration observations. An integrated infrared illuminator, flexible rubber eyecups, and adjustable interpupillary distance make the NVS-7 a full-featured NV biocular for a wide range of low-light glassing tasks.